In recent decades, the heart of Hegel’s Wissenschaft der Logik––his enterprise of calling into the question and systematically substantiating all of thinking’s basic concepts and rules––has struck many commentators as outdated if not outright misguided. 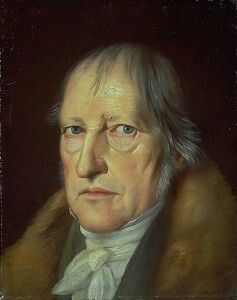 In an effort to make Hegel’s thought relevant, Hegel studies have largely focused on the aspects of Hegel’s philosophy that are most compatible with our current philosophical climate. In contrast, however, my approach embraces Hegel’s philosophical radicalism. In my paper, I will first sketch out Hegel’s place within a broader tradition of what I term radical philosophy. Subsequently, I will turn to examine what I take to be an essential characteristic of Hegelian radicalism: his commitment to a presuppositionless investigation. Finally, I will propose that if Hegel’s investigation is presuppositionless, he also cannot presuppose philosophy’s nature, method, and aims. Determining the feasibility of the Logik therefore boils down to assessing the extent to which it accounts for its own nature, method, and aims. This entry was posted in Philosophical and tagged Hegel, radicalism on 07/03/2018 by Mary.